Delta Electronics India Pvt. Ltd, a leading Power and Energy management company, launched Mumbai’s first DC Fast-Charger station at Maharashtra Mantralaya. 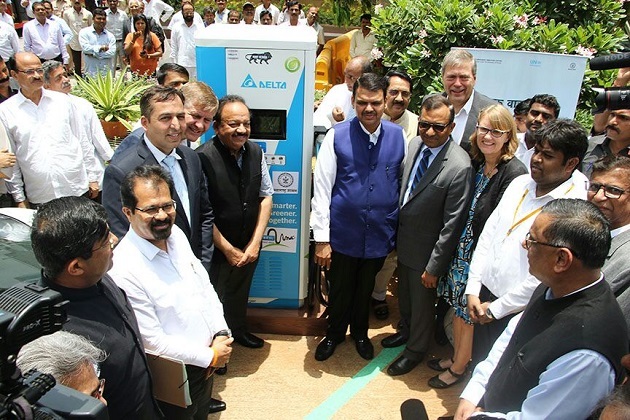 The EV Charging Station was launched by Dr. Harsh Vardhan Union Minister for Science & Technology & Earth Sciences, Government of India and Mr. Devendra Fadnavis, Chief Minister of Maharashtra. The DC Fast Charger station that is provided by Delta at Mantralaya has the capacity of 15 kW and is made based on the Bharat EV specifications standard. Delta’s comprehensive portfolio of energy efficient advanced EV charging stations will offer solutions to all kind of e-buses, e-cars and commercial electric-vehicle(EV), including the newly launched e-cars such as Tata Tigor and Mahindra Verito. Once fully charged the car battery is able to sustain up to 100 to 120 km. ARAI certified these chargers are designed and manufactured locally further supporting GOI’s Make in India initiative,” he added.